Another day, another batch of Samsung Galaxy S10 rumors and leaks. We would very much like to tell you that the bigger picture of Samsung's next flagship lineup is finally shaping up and making sense, but the truth is info is still all over the place. Under such circumstances reputation can actually count for quite a bit in the "leakster" realm and Ice universe has a fairly good track record in this regard. 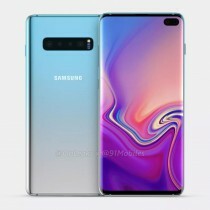 That being said, let's first assume that there will be thee main versions of the Galaxy S10, since that is a thing most sources seem to agree on. Those would be the lite, "vanilla" and plus. Or at least something of the sorts. Any other potential 5G variant is just way too elusive to even discuss at this point in time. Having established the base lineup, we can first take a look at a trio of transparent cases, published by Ice universe that feature claims of 5.8-inch, 6.1-inch and 6.4-inch display diagonals for the trio of S10 models, respectively. We'll get back to these in a bit. The arguably more important info, scribbled on the photo seems to relate to battery capacity. An earlier leak already hinted at 3,100 mAh of battery in the smallest S10, which is reaffirmed here, giving a bit more credibility to the other two numbers: 3,500 mAh for the regular S10 and 4,000 for the plus. If we assume that the S10 "lite" has its closest correlation with the current Galaxy S9, which does make sense given the apparent display size similarity, than this does constitute a small bump up in battery. That naturally leaves us comparing the rest of the suggested S10 lineup with the Galaxy S9+ and Galaxy Note9, again based on relative size. We thus find battery capacity line up perfectly, which makes sense. Actually, circling back to the S10 "lite" and S9 correlation, it starts to make even more sense to look at the upcoming lineup in this way if we believe Ice universe's info that all three S10 devices, including the smallest of the bunch, will be using the same Snapdragon 855 or Exynos 9820 chipset (depending on the market). That would probably make them equal in overall performance and features - a pretty typical Samsung market approach. As for screen sizes, Ice universe also published a video, comparing what he describes as the "protective film of S10 and S10 +" to a few other devices and this is where things get a little bit hairy. 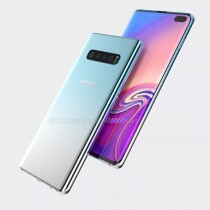 The glass screen protector he is holding is clearly curved, which likely means that it is not for the S10 "lite", since most agree that it will use a flat panel and potentially even one without a punch-hole/Infinity-O selfie camera design. Ruling that out, we clearly see that whatever phone the glass protector belongs to, it matches the Galaxy S8 almost perfectly in size. Naturally, that makes it smaller than the S9+ and the Note9, also featured in the video. Plus, there is also another recent video that shows what is said to be an S10+ case fitting perfectly on the S9+. Our best takeaway from all this is that Samsung's new display "chin" and selfie camera design have enabled the Korean giant to grow the screens of its current lineup quite a bit, apparently without modifying the overall footprint. In that case, the "lite" moniker might just make even more sense. If the regular S10 is physically nearly identical in size to the S9, only with a display diagonal bump form 5.8 inches to 6.1 inches, that would be a clear line of succession there. 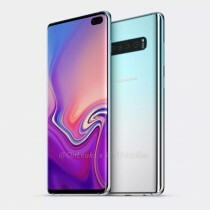 Plus, such a move would differentiate the smaller, flat display, "classic" camera design S10 "lite" quite a bit more from the rest of the pack. This does, however, turn our previous battery capacity comparison on its head. Admittedly in a very positive way, insinuating quite impressive battery growth. But, we're rambling at this point and clearly there is still more to learn about Samsung's upcoming flagship lineup.